Can you create a meaningful life out of something you love? If you want to be successful at your job and move up the company ladder you need to be passionate about your work. You need to be motivated and driven to be the best you can be regardless of your job or your work. Passion, drive, motivation, the self-driven attitude about your job and your work that can help lead you down the path to success. I believe our success comes not so much from what we do, but how well we do. It also illustrates that regardless of your job or your position on the company ladder, you can be successful if you have passion for your work, we can all be successful – this is very much down to how much we apply ourselves to life. Passion is the energy that pushes marathon runners over the finish line, that keeps the artist chiseling, or painting, or typing, day after day and night after night. Passion without a plan, without action, and without hard work and without passion you’ll run out of energy long before your actions yield the desired result. How much energy would you have tomorrow morning if you knew that the work you were going to do when you got out of bed was going to impact the world in a way that would fuel your inner fire? 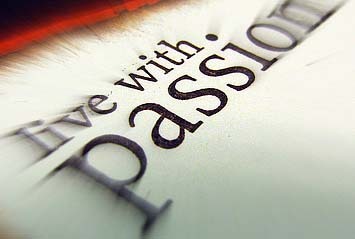 Passion is an emotion that comes from within you. It is your enthusiasm, your zeal, your drive and your motivation. You don’t want to just feel passionate about your job, you want to put passion into it. You want to apply all of your skills and all of your energy into your work. Passion does not go unnoticed. People will see how well you do your job and your attitude towards it. They will see even if a task is hard you don’t give in, you apply yourself even more to overcome it. They will notice your drive and your motivation and consider how you would do in another position. Next PostNext How do you sustain long term change in a business?